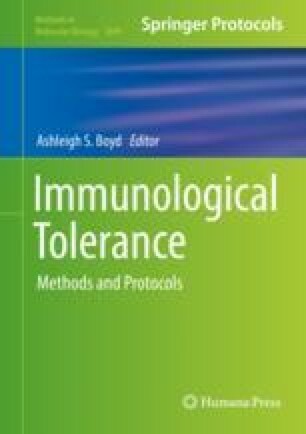 During that past two decades, advances in techniques for generating in vitro immune-suppressive dendritic cells (DCs) have heralded the use of these pro-tolerogenic DCs as therapeutics against transplant rejection and autoimmune diseases. In transplantation, previous dogma assumed that systemically administered therapeutic DCs bearing donor antigens (Ags) control the anti-donor response by directly interacting with anti-donor T cells in vivo. However, recent evidence indicates that the exogenously-administered therapeutic DCs instead function as Ag-transporting cells that transfer donor Ags to recipient’s Ag-presenting cells (APCs) for presentation to T cells. In secondary lymphoid organs, presentation of acquired donor Ags by recipient’s quiescent DCs triggers deficient activation and eventual apoptosis of donor-specific effector T cells, leading to a relative increase in the percentage of donor-specific regulatory T cells. This chapter describes the methodology to generate in vitro immune-suppressive DCs that are resistant to maturation, and to assess in vivo both their survival and their ability to regulate donor-specific T cells in a mouse model. We thank the comments of the Research Specialist William J. Shufesky (Univ. of Pittsburgh, Pittsburgh, PA, USA).